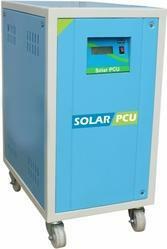 Prominent & Leading Manufacturer from Jalgaon, we offer solar pcu. This is new arriving product of Soyo Systems. We are engaged in manufacturing supplying wide assortment range of Solar Inverter power conditioning unit (PCU). We manufactures solar Inverters with DSP based controllers and with MPPT Chargers . Off Grid In small Domestic - 600 /800 /1500/3000 VA.
As per MNRE specifications- 1 TO 100 KW in Single and three phase. Solar power is a reliable, efficient and effective method to power either alternating current (AC) or direct current (DC) loads. This solar system consists of three major subsystems, the solar panels, the batteries and the inverter circuit. The solar inverter is more efficient as compared to regular inverters. A regular inverter basically uses a battery to store energy from the grid when supply is available. When the grid is cut off, it basically switches to power from the energy stored in the battery. Where as -A Offgrid Solar Inverter, generally works as on SOLAR priority basis ,When solar power presents it checks the battery status ,and it starts working from solar power to laod and if Solar power avilable is less than the load requirement it starts taking the power from Batteires ,If the batteries are dischrged upto certain levels ,it takes the power from mains automatically . The Logic can be changed as per customer requirements. Looking for Off Grid Solar PCU ?